Balsamic vinegar (Aceto Balsamico di Modena) comes from Modena in the Emilia Romana region of Italy. The vinegar is made from grape juice which is simmered down to create a very concentrated liquid. Once it has been turned into a very concentrated liquid, it is then put into wooden barrels to ferment, sometimes for decades, and these are, by far, the sweetest and most expensive to buy. Balsamic is a wonderful condiment and loved by cooks and chefs the world over for its complex, thick vinegary sweetness. However, you can create your own concentrated sweet vinegar at home which mimics - but can never replace - the genuine one at a fraction of the price. And it is so, so easy to do. 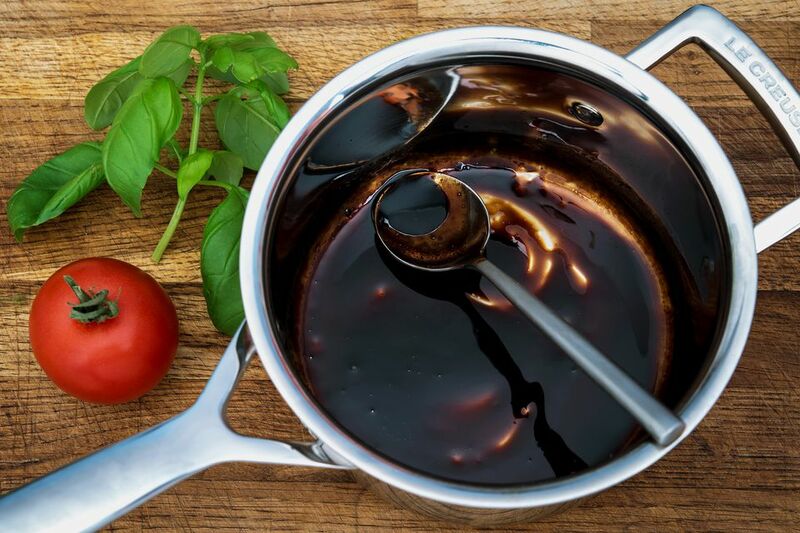 The balsamic vinegar to use for the reduction should not be the aged ones, but the commercial and much cheaper ones, which tend to be less sweet and colored using caramel rather than fermentation. They are excellent to use in salad dressings and are perfect for making a balsamic reduction. Once you have made your reduction, its uses in the kitchen are endless. From decoration through to adding an extra dimension of flavor to many, many dishes such as meats, fish, cheeses, and vegetables through to strawberries (yes, you read that right), and even ice cream, this recipe is surprisingly versatile. Before you begin, turn the extractor fan on high or open all the windows as there are going to be quite substantial vinegar fumes. Put the vinegar into a non-reactive saucepan, preferably one with a thick bottom. Gently heat the vinegar, ever so slowly, until it starts to simmer. Lower the heat to keep the vinegar simmering and patiently allow the vinegar to reduce. Do not try to rush this bit, it is a long process, and the vinegar is ready when it turns into a syrupy glaze; it will continue to thicken as it cools so remove from the heat a little ahead of it becoming too thick. You can always pop it back on the heat again if you need it thicker. Remove the pan from the heat and allow the vinegar to cool. You can store your glaze in a glass jar or bottle, and it will keep for several weeks; the vinegar does not need refrigerating. The recipe above is for a straight vinegar; you can take creative liberties by adding flavorings to the vinegar as it reduces. Herbs add good strong flavors, but avoid any soft herbs (basil) as they are likely to rot in the acidity and with the heat. Instead, use the hard stemmed varieties such as rosemary and thyme. Always strain the reduction to remove the herbs and stems before using or storing. Fancy a little extra sweetness, then add a tablespoon of honey or agave. A little light spice is always good, especially cloves and cinnamon. Or, even a small pinch of chili flakes. Be careful not to use too much; you do not want to overpower the sweetness. A classic combination and one you will find all over Italy and the rest of the world is a caprese salad which consists of exquisite Buffalo mozzarella, squeaky fresh tomatoes, basil, and here, drizzled with a heady balsamic reduction. A fabulous way to dress up beets is balsamic barbecued beets. Before cooking, they are drizzled with the vinegar and then dressed again but with a balsamic reduction. Delicious. A lovely scent and flavor of honey infused into the balsamic reduction in this sweet potato spinach and onion tart.